A Syrian rebel group claims to have seized the footage after a raid of a pro-government compound in Aleppo. Syrian President Bashar al-Assad (left) and Iran's former president Mahmoud Ahmadinejad listen to the Syrian national anthem during a welcoming ceremony in Tehran. Rebels battling Bashar al-Assad's forces in Syria have long claimed Tehran was directly involved in the fight. The smoking gun that would prove it, however, was lacking. Now, video footage that appears to show members of Iran's Islamic Revolutionary Guards Corps (IRGC) working alongside Assad's forces is being portrayed as evidence of a direct Iranian combat role in the Syrian conflict. Others are not so sure, saying the video only shows what was already known — that the IRGC has been training pro-government forces in Syria. The video shows fluent Persian-speaking personnel in military fatigues working with a pro-government Shi'ite militia at a makeshift base in the flashpoint city of Aleppo. The video, whose authenticity has not been independently verified, was released last week by the Dawood Brigade, a Syrian rebel group that claimed to have seized the footage after overrunning the base. There are reportedly several hours of footage, only part of which the group put on the Internet. The footage was reportedly recorded by an Iranian documentary filmmaker who was embedded with the unit and is believed to have died in the fighting that ensued when the rebels stormed the base. At one point, the camera falls to the ground and the screen goes black as bullets are heard zipping past. The Iranian government has strongly rejected allegations that the country is involved in combat in Syria. And during a September 17 press conference, Foreign Ministry spokeswoman Marziyeh Afkham said the video was fabricated. "We don't have any official military presence in Syria and if any footage or propaganda exists in this regard, they should be examined within another framework," Afkham was quoted as saying by Fars news agency. Her answer prompted a follow-up from Ramin Mostaqim, correspondent for the Los Angeles Times, who asked Afkham whether "Iran may have an unofficial volunteer presence in Syria." The spokeswoman offered no direct response. Scott Lucas, an Iran specialist at Britain's Birmingham University and editor of the EA WorldView website, believes the video is real. But he says the real point of contention is what the video actually shows. Lucas says the video merely confirms the IRGC's announcement in September 2012 that it was training Shi'ite militias in Syria. "The video is definitely real. The problem is that almost all the reports of the video have lifted it out of context, in some cases distorted it, and they've also missed the bigger picture," Lucas says. "Some have turned this into a claim that Iran is running the Syrian war, which is just an exaggeration. What the film shows is Iranian officers training Syrian militias in different locations across Syria." Esmail Kowsari, an Iranian lawmaker, made that distinction on September 16. "We do not send military forces to Syria," he said during a meeting of the parliament's national security commission. "The only thing we do is to transfer our experience to Syria." Iranian President Hassan Rohani has called for a diplomatic solution to the Syrian crisis. 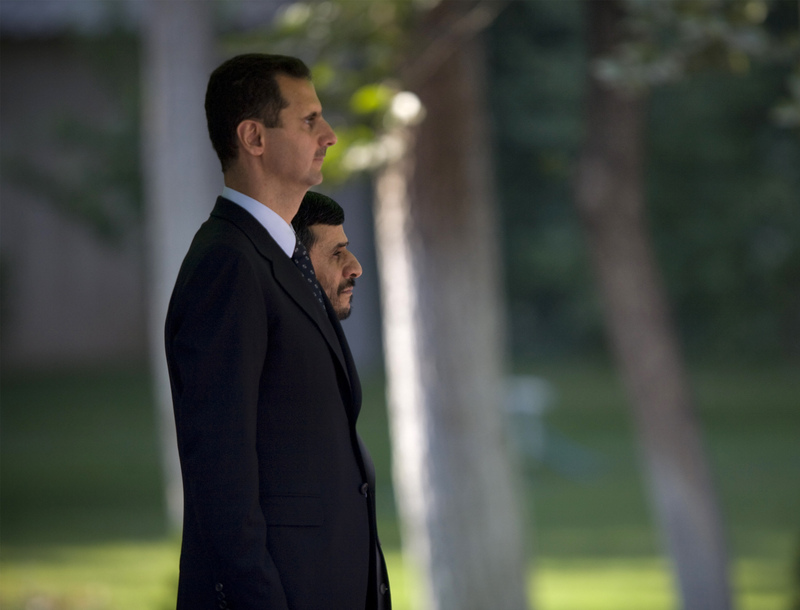 On September 16, he said Tehran would accept any Syrian ruler who was elected by the people. "Whoever Syrian citizens vote for to rule their country, we'll agree with it," Rohani was quoted as saying by Iran's IRNA news agency. Rohani was addressing commanders of the IRGC. Rohani's remarks marked a shift from previous statements by Iranian officials, who vowed never to allow the fall of Assad's regime. Syria is a key regional ally and lifeline for the militant Shi'ite group Hizballah, Tehran's proxy in neighboring Lebanon. In the footage, the Iranian speakers shown know they are being filmed and freely discuss their role in the conflict. One apparent Iranian commander says he has been in Syria for nearly a year. The commander says the Syrian fighters have friendly relations with their Iranian counterparts because they have received training in Iran. "They're familiar with our customs and that makes cooperation easier," he says. The Iranian commander also characterizes the Syrian conflict as a "holy war." "The war we're fighting is not with the Syrian people," he says. "The current war in Syria is that of Islam versus the nonbelievers. Good versus evil." He says that "Iran, Hizballah, and Iraqi and Afghan mujahedin [holy fighters]" are on the side of Islam, while an alliance of "Israel, Saudi Arabia, Turkey, Qatar...funded by the [United Arab] Emirates plus the United States, England, France, and Europe" are on the side of the nonbelievers. The commander has been identified by several media outlets as Ismaeil Haidari (alternative spelling Esmail Heydari), a senior IRGC commander. Iranian media reported his death in Syria in August. Photos published in the Iranian media showed mourners attending his funeral in a northern town in Iran. Around the same time, Iranian media reported that the Iranian documentary filmmaker Hadi Baghbani had died in Syria. Commentators suggest it is possible that Baghbani was shooting the film that was captured by the Dawood Brigade.